Power Rangers follows five ordinary teens who must become something extraordinary when they learn that their small town of Angel Grove, and the world, is on the verge of being obliterated by an alien threat. Chosen by destiny, our heroes quickly discover they are the only ones who can save the planet. But to do so, they will have to overcome their real-life issues and before it's too late, band together as the Power Rangers. 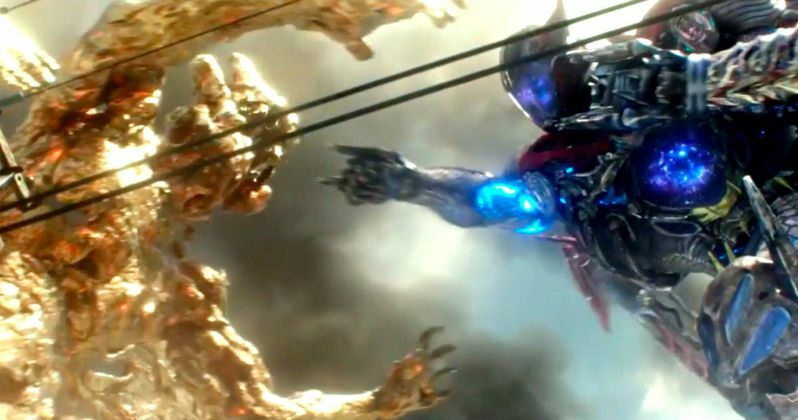 The second trailer for Power Rangers has finally been unleashed, and it's epic! We finally get to see these teens suited up and in action. That's something the first teaser, which was released late last year during New York Comic Con, didn't give us. Now here they are in all their glory. Not only that, we finally get to see what else this movie has to offer. Here is our first look at Rita's henchmen the Putty Patrollers. We get our first look at Goldar. And Bryan Cranston is finally introduced as Zordon. This latest sneak peak is actually a continuation of the first trailer, and picks up where that one left off. We get to see these five teenagers as they are introduced to Zordon for the first time. And we also get a proper look at Alpha 5 in the metallic flesh. The Rangers quickly jump into battle to protect their hometown of Angel Grove and the Earth from Rita Repulsa and her forces. They all bring their Zords together to form the Megazord, which until now has only been seen in toy form. This looks nothing like the TV show with its big budget and darker tone. There is big action and some laughs. This could very well be the Power Rangers movie fans have always wanted. With an extensive and extremely devoted worldwide fan base as well as a deep and detailed mythology, the Power Rangers are now primed for the big screen. This new film franchise re-envisions the Mighty Morphin Power Rangers as a group of high school kids who are infused with unique and cool super powers but must harness and use those powers as a team if they have any hope of saving the world. There are at least two sequels planned. Says Saban about he movie. Power Rangers stars Becky G (Yellow Ranger), Naomi Scott (Pink Ranger), RJ Cyler (Blue Ranger), Dacre Montgomery (Red Ranger) and Ludi Lin (Black Ranger), with Elizabeth Banks also starring as the villainous Rita Repulsa. Bill Hader provides the voice of Alpha 5, as Bryan Cranston portrays. Get your first look at this all-new footage here courtesy of Lionsgate.